Know where your food comes from. - Buy Direct from our Growers below and Save. Grows well over most of the USA from up North to the warm winter areas but marginal along the gulf coast and So. Cal. Harvests in late summer - stores through spring. I have only recently discovered the S & H Silverskin and already I treasure it. Superlatives are the order of the day. The bulbs are large and firm and the outer bulb wrappers are thick and white but one discovers their true inner beauty as the white wrappers give way to a rosy hue as the cranberries in cream-colored clove covers become visible. They taste as good as they look. Wow! The taste is magnificent - Rich and musky in garlickiness, yet mild in pungency. Long on flavor and short on burn. If you want the bold taste of real garlic in your recipes, try this wonderful long storing cultivar. Bulbs will average eight to twelve large cloves per bulb with very few small cloves, unlike some Silverskins. While the taste is mellow for a few months after harvest, the longer it stores, the hotter it becomes when raw. Originally grown at S & H Organic Acres, it is a wonderful very long storing garlic for braids or just storing through the winter and still being good the following Spring. 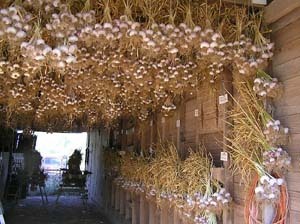 S & H Silverskins are very late harvesting, very long storing garlics. They have several clove layers and wrapper layers; that's what makes them so long storing. NOTE: None of the growers in our farmers market currently have this cultivar for sale. If you grow this cultivar organically and wish to sell it in our online farmers market, please click here to contact us!